How Should I Handle Pest Control in a New Clinic? Treat the ground before building begins. Pesticides that are applied under the foundation are too deep to endanger animals. If possible, keep all structural wood one foot above the soil. Choose wood that has been pressure-treated with pesticides for structural beams and fence posts. Install metal termite shields around in-ground wooden beams. Avoid stucco siding that reaches the ground. The porous material creates termite entry points. Extend floor tiles about five inches up the sides of the walls, using epoxy for the grouting. These materials can withstand frequent cleaning, but fleas and ticks can’t. Less expensive linoleum and sheet-vinyl floors are also an option, but they can crack within a few years of installation, so repair costs often offset the initial savings. Seal case work and plumbing features with silicone. This coating denies fleas and ticks access to their favorite hiding places. 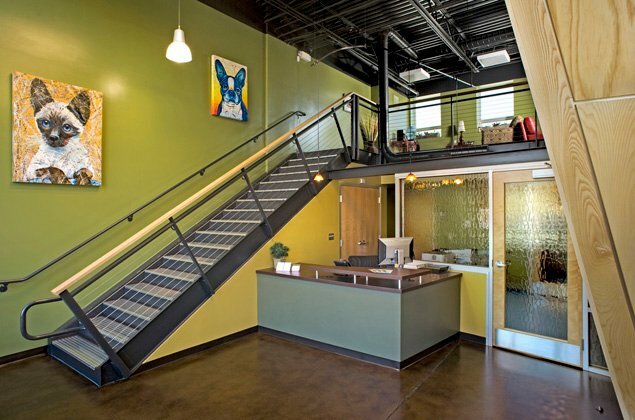 Clients spend the most time here, so let the design illustrate your level of care and competence. 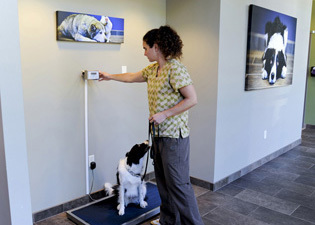 Once upon a time, veterinary exam rooms were comfortable, uncluttered, and easy-to-clean areas where practitioners performed physical examinations on pets. This definition isn’t wrong, it’s just outdated. Today’s exam rooms need more features that reflect the high-quality care and customer service clients have come to expect. 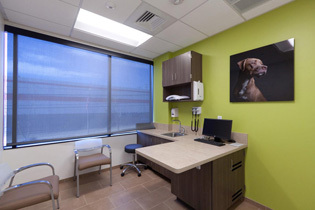 When it’s time to design or renovate your exam rooms, modernize them by ensuring they fit these criteria suggested by Dennis Cloud, DVM, owner of Cloud Veterinary Center in St. Louis, Mo. Equip at least one exam room with a mobile, lifting exam table. If a client arrives with a dog that’s been hit by a car, you can take the table out to the car and return directly to the exam room with the dog. In other rooms, folding wall tables save space and eliminate a barrier between you and clients. They can also create a more open feel in exam/grieving rooms. Adequate storage space is essential for a thoroughly equipped exam room, so plan ahead. And don’t forget client education materials. Dr. Cloud stores his inside the cabinets and displays them in wall racks. To educate clients more effectively, upgrade your clinic with digital technology (e.g., digital photography, radiography, ultrasonography, endoscopy, and electrocardiograms) so clients can see images and results on the exam room monitors. Here is a quick little exercise: Take 30 seconds to reflect on some of the day-to-day tasks that take place around your hospital. Not just the more obvious ones, like surgeries, but some of the more basic tasks that while small are still a critical part of the overall operation of your hospital, such as sterilizing equipment and restocking supplies. Now think about how these tasks are affected by the design and layout of your space. Is your shelving at an easily accessible height? Are your countertops deep enough? Is equipment easily accessible, especially in an emergency? Hopefully, you just opened your eyes to some of the smaller, but vastly important, aspects that go into designing a new hospital. It is easy to get fixated on the bigger aspects of hospital design, like the overall look of the building or how spaces work and flow together. But successful hospital design also comes from designing for these “small things”. Over the years, we have learned how vastly important equipment coordination is when designing a new facility. It’s an essential component that is often overlooked or left until the end. But the sooner we can coordinate equipment with our clients, the better off we all are in the end. From defining the necessities like lab equipment and animal housing, to determining how equipment will be used and stored in areas from treatment to offices, early equipment decisions can create a more efficient and well thought out hospital. Let’s take the pack/prep area for example. Every veterinarian has different needs in their pack/prep. 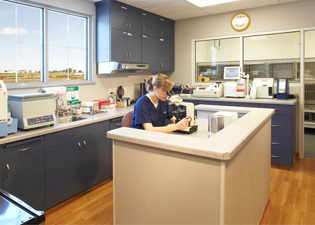 Specialty hospitals might require a large floor model autoclave, but a standard veterinary practice may only utilize a countertop model. Either way, there are design considerations. 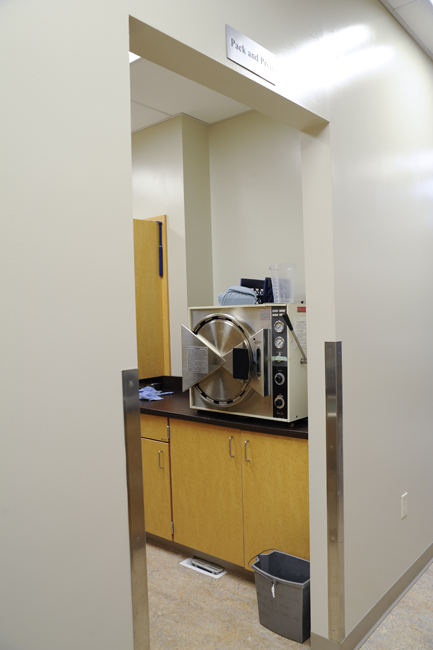 With a floor autoclave, considerations include the overall size of the unit, required floor clearances around the autoclave, and even the coordination of a floor sink and built-in hot and cold water plumbing for the unit. As one can imagine, these requirements will quickly begin to dictate the overall size of your pack/prep area. On a smaller scale, a general practice hospital will likely use a countertop autoclave, which might not seem like a big deal. However, most countertop autoclave models are actually deeper than a standard 24-inch counter. So building a deeper cabinet base might be imperative to the design. In addition, the manufacturers of these countertop models typically recommend the use of distilled water. So will you bring in outside bottles of distilled water? Or would you rather have a relatively inexpensive reverse osmosis system built in at your sink in pack/prep? These are all examples of the everyday things that are important to consider during the design and coordination stages of your hospital project. What can you do to be prepared when it comes time to design your hospital? Decide Old Versus New. Will you be reusing equipment from your existing facility? If so, which pieces? In contrast, which pieces of your current equipment need to be replaced? Do you need to purchase any new equipment that you don’t already have? Are there any pieces of equipment that you plan to purchase in the future as your practice grows, and how can you plan for and accommodate for them in advance? Collect Information. If you are planning to reuse current equipment, start gathering your information ahead of time. Write down the model numbers and/or dimensions of each item. Locate the operation manuals for each piece of equipment; these usually describe any required special conditions and can often be found online. Go Shopping/Browsing in Advance. Make a list of the new equipment you need to purchase and become educated on the products available. In today’s market, medical technology is constantly changing, and therefore, so are the available products. Do your research. Talk to your colleagues about what equipment they use. Visit trade shows; there is no better place for one-stop shopping. You won’t be expected to have all your equipment purchased in advance, but having an idea of which specific products you think you want can go a long way during the early design process. Share. Compile all of the information you have collected into a folder or spreadsheet, or whatever works best for you. Be sure to give this information to your design team as early as possible so everyone is on the same page. Ultimately, the more upfront equipment planning you can do the better. 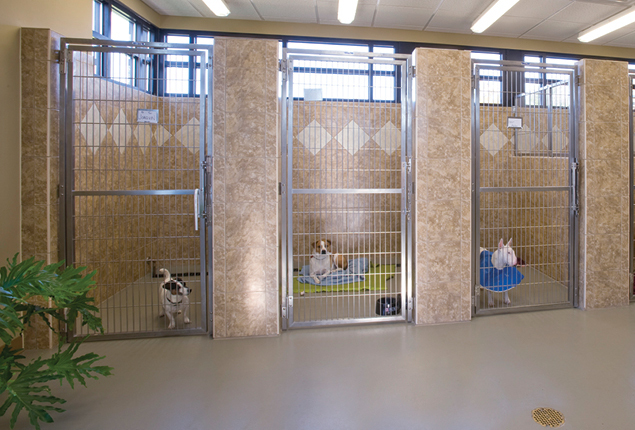 Having an architect who knows the ins and outs of veterinary equipment and design will also help immensely. The combination of your upfront planning and the architect’s expertise will allow for the ultimate collaboration on your new hospital – a collaboration that will result in a smooth design process and a well thought out hospital that will work for you for many years to come. Don’t give animal housing short shrift just because people spend less time there. Instead, install well constructed runs; maintain bright, well-painted walls; and make sure the areas receive proper heating, cooling, and ventilation. Some practice owners play videos in the waiting area to show clients the clean, pleasant conditions their animal housing offers. Others set up Web cameras so clients can see images of their pets online from a hotel in Paris or a vacation house on Cape Cod. Of course, your idea of hospital essentials might not include Web cameras. You may prefer to order a lift table for one exam room instead. But once you decide what you must have, you can concentrate on resolving any design uncertainties. What clients see in the exam room often determines what they think about the medical side of the practice. Dimly lit, smelly, and cluttered exam rooms will raise a red flag for any client. “You could have the greatest reception area in the world, but if the exam room is messy, the client is going to think that’s what your practice is like,” Chapel says. He recommends a bright, clean, orderly exam room with a good ventilation fan. The exam room is also a great place to showcase high-tech equipment, such as an X-ray reader or exam light, because it shows clients you run a state-of-the-art practice. Children aren’t the only ones vying for clients’ attention. With cell phones, busy clients can now take care of personal and professional business wherever they go. Well-designed waiting rooms now include client convenience counters—out-of-theway desks that resemble library carrels. Equipped with a pen and notepad (imprinted with the hospital’s logo, of course), these counters allow clients to take notes during calls. Adding coffee or bottled water will impress your clients even more. Brought to you by Contributing Editor Ashley M. Shoults of Animal Arts. It happens all the time. You reach the point in the design of your hospital where it’s time to pick material and paint colors, and the stress and anxiety begins to set in. How can I pick colors from just these little samples? Should I choose a bold, vibrant and exciting color palette or stick to more traditional neutral shades just to play it safe? And no matter what I choose, how will these colors actually look when they are installed? These are the types of questions many people ask as they design their hospital, and it’s only natural. Color can be a scary and daunting thing. But it doesn’t have to be! Vibrant, punchy colors are the “in” thing these days. 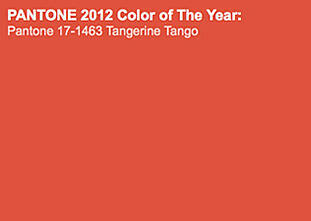 Just look at the past two Pantone Colors of the Year….Tangerine Tango and Emerald Green! 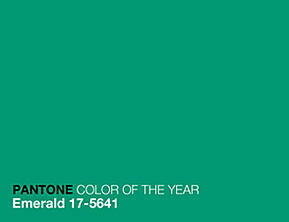 It might be hard to picture a whole wall painted in one of these very bright colors. They seem overwhelming, right? But when used correctly, these vibrant colors can really liven up your hospital space. For those who don’t mind living on the edge, using lively paint colors as accent walls can be really fun and energizing. However, be careful not to overdo the accent colors or your space might start to overstimulate you, your staff and your clients. One technique to find balance when using bright colors is to let neutral colors ground the space. For example, design your floors and cabinetry with neutral and sophisticated colors, and then add punch with bright, lively accent walls. 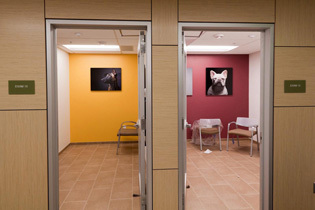 Hospitals can also look really great when color is used virtually everywhere. That might sound overpowering, but when done right, it not only enlivens your space, but also warms it up and makes it feel more inviting. The trick with this approach is choosing colors that are a little less intense and that are within the same color family and general tone. If you prefer a more traditional aesthetic, there are ways to bring color into your space without bright accent walls. Try letting your cabinetry or furniture do the talking. Even though the current trends are showing bold, vibrant colors as the new thing, many designers are creating rooms with very neutral colors on the hard-built environment (walls, floors, etc.) and adding accent colors through furniture, cabinetry, and other decorative items. For example, you could pick a brighter color for your built-in cabinetry or add some colorful pendant lights above the reception desk and some artwork to add a fun factor to the space. Or perhaps pick some vibrant fabrics for your lobby seating to jazz things up. Ultimately, when it comes to picking the colors for your new hospital or renovation, the goal is to not let color scare you. When done right, color can often be a key factor to bringing in a little touch of energy and interest that makes your hospital feel more welcoming. Clients are often faced with tough decisions, such as whether to euthanize a pet or approve a costly surgery. Imagine trying to make those decisions with a young child pulling at your leg. A play area in the waiting room occupies children and allows doctors and parents to talk without interruptions. Once clients check in, they head straight to the waiting area. The best-designed waiting rooms are separated into alcoves by dividers, such as half-height walls or large potted plants. This allows clients to find their own comfort levels—away from a noisy child, for example.